(Steinhowel 1479) 91. 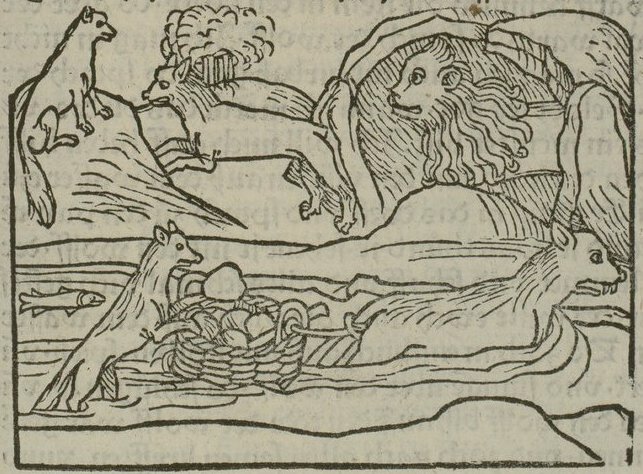 De vulpe et lupo piscatore et leone. (Steinhowel 1501) Click on the image to see the entire page (and the following page). 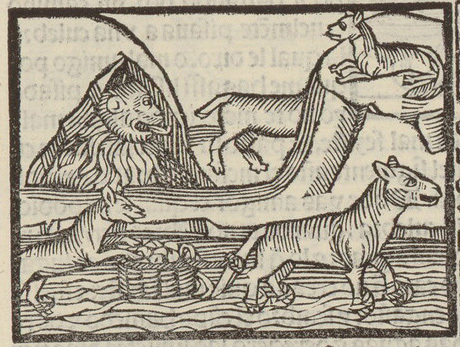 Illustrations from the 1479 edition of Steinhowel come from the online edition at the Library of Congress. This edition is in German, not Latin, so I have reproduced only the images here. The illustrations for the 1501 edition of Steinhowel are online at the University of Mannheim. So that you can see the Latin text on these pages, each 1501 image is linked to a full page view of this edition (although the images are poor quality gif images, unlike the high-quality images at Library of Congress). Finally, I have included a 1521 edition of Steinhowel translated into Spanish, also from the Library of Congress. As you can see, the illustrations continue to follow the same basic pattern but have a decidedly different element of style.